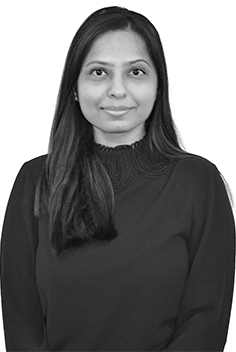 Neha joined Caisson in April 2016 from Berkeley Homes South East London Ltd as a Finance Assistant, working closely with both the Finance Manager and Finance Partner. Neha worked for Madhuhar Industries from 2010 to 2012 as an Assistant Accountant, where she was responsible for processing invoices, making payments, and resolving queries. Moving to London in 2012, Neha first worked as a Finance Assistant at InterQuest Group plc, and subsequently from October 2014 as an Accounts Assistant at Berkeley Homes South East London Ltd. Here she was responsible for invoicing, credit control, producing weekly cash flow reports, and weekly sales reports for the senior management. She also assisted in month end reporting, and supported the management accountants in their various tasks, including balance sheet reconciliations. Currently, Neha is a part-qualified CIMA (Chartered Institute of Management Accounting), and holds a Masters degree in Commerce (M.Com) from the University of Mumbai. She speaks English, Hindi and Gujarati. Neha’s focus within Caisson is meeting the month and quarter end reporting requirements of our investors.